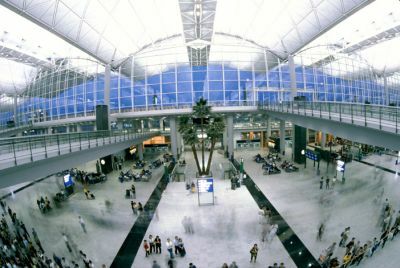 The construction of Hong Kong International Airport at Chek Lap Kok was one of the biggest operations in the industry. The core programme cost more than $20bn and involved four major sponsors, ten separate projects, 225 construction contracts and over 1,000 critical interfaces. The airport covers 12.48km² of reclaimed land between the two islands of Chek Lap Kok and Lam Chau. The airport increased the land area of Hong Kong by 1%. The airport opened for business in July 1998 taking six years to build. The passenger terminal claims to be the world’s largest enclosed space with 70 moving walkways stretching more than 2 miles, a pilotless electric train, 150 shops and a 1100-room hotel. The flat-island housing Hong Kong International Airport was actually two mountainous islands when the construction began. But the mountains were pulverised and their rocks recycled to fill 1.5 miles if sea now connecting Chek Lap Kok and Lam Chau. A new transportation corridor stretches 34km from Hong Kong Island to the site of the airport, incorporating a high-speed rail system, two tunnels, two bridges and a six-lane expressway. It contains the world’s longest double-decker suspension bridge. Designed for the rapid movement of millions of passengers, the airport has 288 check-in counters, 200 immigration desks and 80 customs positions. The new airport also boasts 2.5km of moving walkways and around 120 shops. The 1.3-mile long Tsing Ma Bridge is teh world’s longest span suspension bridge, linking cars and railway traffic between Lantau Island and the rest of Hong Kong. Part of the comprehensive transportation network, its concrete towers rise nearly 700 feet. It is the world’s seventh longest span suspension bridge. It has two decks and carries both road and rail traffic, which also makes it the largest suspension bridge of this type. The bridge has a main span of 1,377 metres (4,518 ft) and a height of 206 metres (676 ft). The span is the largest of all bridges in the world carrying rail traffic. The shopping and leisure facilities include the airport’s SkyMart with 160 shopping outlets and 40 restaurants spread over 39,000m². The facilities also include free and pay internet lounges, Wi-Fi access, many lounges and TV screens and a children’s play area. The superior facilities have meant that the airport has been voted the world’s best in 2002, 2003, 2004 and 2005 (came first in Skytrax’s world airport awards in 2007) and is consistently in the top-five list.